The White Chamber is a Bolgar city bathhouse. It was built in 1330-1340 of variously shaped stones (limestone with outer cladding made of finished blocks and inner rag-work with lime plaster). Thickness of the three-layer masonry ranges from 0.85 to 1.15 m.
The building dimensioned 33-17 m in plan consists of several variously sized rectangular sections. The central cruciform hall holds the remains of a washing chamber with a pool, a fountain and rooms located at the corners. The bathhouse was heated by two stoves. There is evidence of under floor heating, water supply and sewerage systems. 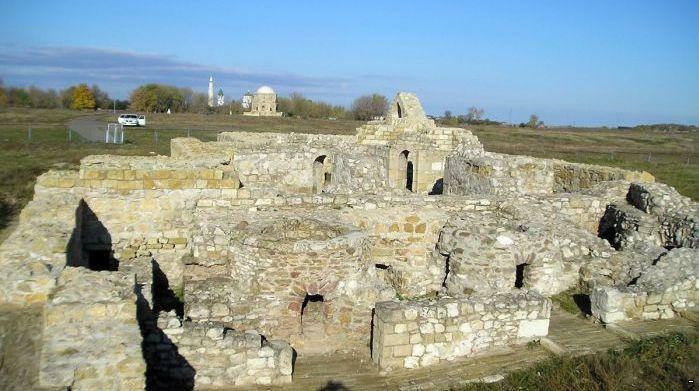 The White Chamber is an example of a building constructed on the model of medieval oriental bathhouses of Central Asia, the Crimea and Transcaucasia. Its erection indicates a well-developed building technology possessed by the Bulgarians and a high development level of the city.